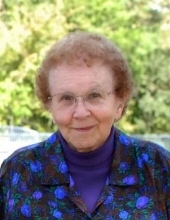 Helen Bjerke, age 92, of Clear Lake, SD passed away on Saturday, April 13, 2019 at the Deuel County Good Samaritan Society in Clear Lake. Memorial service will be held at 10:30am on Wednesday, April 17th at St. Paul’s Lutheran Church in Clear Lake with visitation held one hour prior to the service at the church. Burial will be held at a later date at the Lakeview Cemetery in Clear Lake. Houseman Funeral Home of Clear Lake is entrusted with the arrangements. She was born March 18, 1927 in Clear Lake, daughter of Albert and Hattie (Hartsel) Erichsen. She grew up in Altamont where her father owned the general store. She attended school in Altamont through 9th grade, then finished high school at Clear Lake High School. As a teenager, Helen enjoyed track meets and playing ball. Helen was united in marriage to Donald Bjerke on June 26, 1946. Don and Helen took over her parents’ general store in Altamont where they sold hardware, lumber, candy, pop, and beer. In 1967, they moved to Clear Lake. Helen’s first job was bookkeeping at an electric shop in Watertown, before spending many years as a devoted home maker. She was a member of St. Paul’s Lutheran Church in Clear Lake where she worked for several years as secretary. Helen later worked in the kitchen at the Deuel County Good Samaritan Society. Helen enjoyed gardening, playing cards, and crossword puzzles. She also enjoyed participating in church circles and volunteering at bake sales and soup days. She is survived by four sons: Deane (Peggy) of Buffalo, WY, Daniel of Rapid City, Marlin (Barbara) of Clear Lake, Gary (Netty) of Williston, ND; one daughter, Lisa Ayad (Arnold Rifkin) of Coplay, PA; ten grandchildren: Stacy, Sonia, Jodi, Aaron, Nichole, Amy, Gabe, Gannon, Garret and Sara; eight great-grandchildren, Bailey, Kellen, Elliott, Luke, Eden, Wyatt, Jennifer and Ivy; one brother, Alvin (Lucille) Erichsen of Sheridan, WY. She was preceded in death by her parents, Albert and Hattie; husband, Don; two grandchildren, Shelley and Michael; and one infant brother, Henry. To plant a tree in memory of Helen Jenice Bjerke, please visit our Tribute Store. "Email Address" would like to share the life celebration of Helen Jenice Bjerke. Click on the "link" to go to share a favorite memory or leave a condolence message for the family.